Standing still is regression. This quotation, ascribed to Karl Marx, Erich Kästner and businessman Reinhold Würth in equal measure, is increasingly becoming a statement of belief in today’s industrialised society. The development of new products brings forth new production methods. And the shorter the development times are, the faster the production processes need to be adapted and safeguarded. This applies in particular to lightweight design with fibre-reinforced plastics. This class of materials established itself in automotive construction a long time ago. But while it is still possible to work with manual lamination, for example in the production of rotor blades or sports boats, this somewhat archaic method is not an effective approach for series production. Thermoplastic, continuous fibre-reinforced plastics are gaining ground in automotive manufacturing, as they do not require, for example, long curing and auxiliary process times. Moreover, it is possible in a subsequent step to spray on rib structures as reinforcement that are firmly attached to the matrix. In this context, Neue Materialien Bayreuth GmbH has developed a new process that we are pleased to present to you as the cover story of this issue of lightweight design. The process allows preforms to be produced from unidirectional tapes with very low levels of cutting waste and short cycle times. 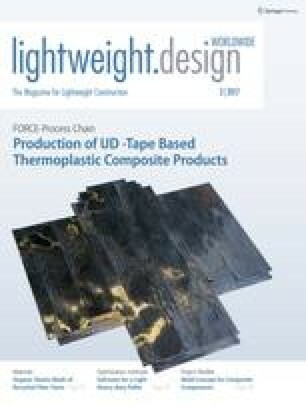 The authors report that the FORCE process chain only takes two seconds to lay UD tapes accurately and with the correct resistance per tape strip, and that in contrast to working with fabric-based organic sheets as semi-finished material, cutting waste can be appreciably reduced by up to 30 per cent. This therefore opens up new ways of meeting requirements for fast and quality-assured production. On a personal note: changes are also taking place within our team. After working for Springer for 25 years, I will be taking partial retirement at the end of the month and passing the baton on to my colleague Thomas Siebel. He is a mechanical engineer with many years of experience, including lightweight design, and will continue to develop the magazine. I would like to extend a warm word of thanks to you as loyal readers for contributing many ideas to our discussion and for your support for our broad editorial concept. I would ask you to show the same level of trust to my successor that it has been my privilege to enjoy.